Canoeing Campout 2019 is Saturday, April 13th through Sunday, April 14th. Details below. WHEN: We meet at LHUMC at 7 am on Saturday, April 13th. We should return on Sunday around “normal” Sunday return time. HOW MUCH: Cost for Scouts is $30 payable to the Troop, which you can pay here, plus $10 to each Patrol QM. Cost for adults is $50 payable to the Troop here or cash/check to David Boone. Saturday breakfast is on your own - eat before you arrive or bring something for the ride. Saturday dinner is being prepared by Mr. May (our host) and will be a BBQ dinner (brisket, pork, beans, etc.). All dinner items will be at Mr. May’s house and we do not have to transport them down the river. CANOES: We will all be paddling in 2-person canoes. An outfitter is renting them to us and will deliver them to the put-in point and retrieve from the end. The trip from the put-in point to our destination is 12-15 miles of river and lake paddling. On Sunday morning, the older boys — Horstman and older — will eat early and paddle down to the dam for extra paddling experience. The Boone and Nicodemus Scouts will stay around the destination area and have some time Sunday morning for some easy paddling and fun. CAMPING: We will be camping overnight in a wooded area with grass and trees. Tents are not recommended due to space constraints in the canoes. We recommend sharing tarps and/or hammocks. You will need something for cover in case it rains. 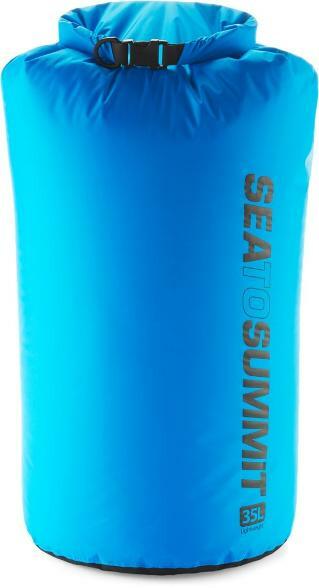 You will need a sleeping bag in a compression bag to save space in your dry bag. You will need your mess kit. You will need 3 full water bottles. You will need a change of clothes. You will need a hat. Toothbrush. Flashlight, etc. ALL of your gear will need to fit into your main dry-bag. GEAR: We strongly recommend heading to REI and purchasing a dry bag of at least 35 l storage. This would be roughly the same capacity size as a typical weekend campout backpack. For the patrol food and other cooking gear, we recommend either additional dry bags or 5 gallon paint buckets (like the orange ones from Home Depot). Each patrol can probably store all of its food in 2-3 5-gallon buckets. There should be sufficient room in each canoe for 2 dry bags with your personal gear and also at least 3-4 5-gallon buckets (or other items). We strongly recommend you acquire a dry bag of at least 35 liters capacity for our trip. Larger would be OK but also more expensive. Click on the image to see the product details. REI for $27.99 or same price on Amazon.